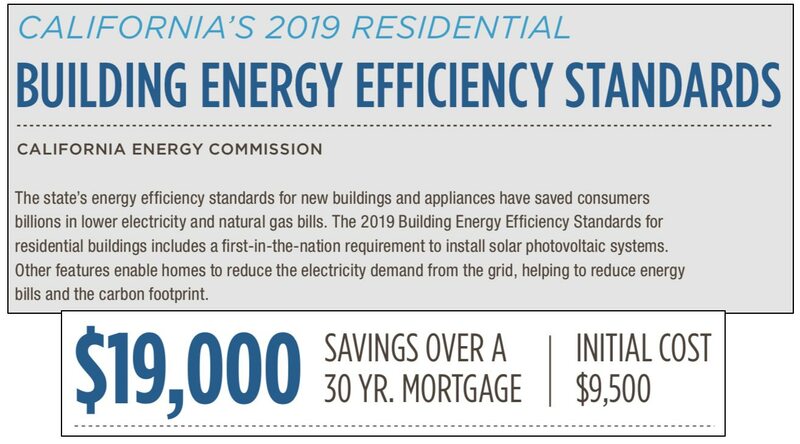 On Wednesday, the California Energy Commission adopted "standards requiring solar systems for new homes" beginning in 2020. Kathleen Ronayne at the Associated Press published a virtual press release celebrating the move, and presented woefully incomplete information about the alleged financial benefits of this unelected body's latest move. Though the requirement isn't official, it only needs the expected rubber-stamp approval of California’s Building Standards Commission. 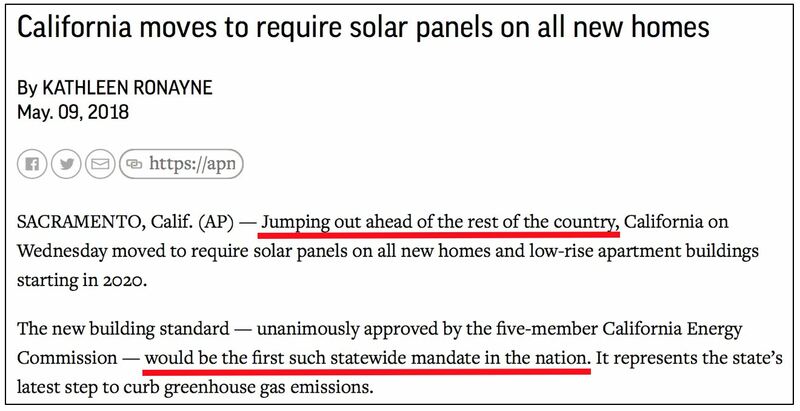 Tuesday, the Los Angeles Times noted that "The regulations ... don’t need the approval of the Legislature." In other words, this is more "green" mischief, courtesy of insulated, unelected bureaucrats. The "initial cost" the Commission presented seems understated. Its related May 9, 2018 "Meeting Packet" shows a figure of $10,500 in two places, and $9,500 once. The higher figure, despite the document's imprecise language, appears to be the increase in a new home's purchase price, which would be higher than the construction cost increase. The higher figure is obviously the one that matters to buyers trying to justify a return on their mandated up-front solar investment. Ronayne's other two errors are far more consequential. The net monthly savings for a 30-year borrower amount to just $40 ($80-$40) — for as long as the buyer owns the house, which is usually nowhere near 30 years. Ignoring the time value of money and using the $10,500 figure discussed earlier, it takes almost 22 years ($10,500 ÷ $40 = 263 months) to get into the black. That's some "investment." The Commission cited no "other expenses" saved besides energy. Finally, the Commission assumed that there are no other costs associated with owning these now-required solar panels. That's wrong. If presented with the full picture, most new homebuyers would balk. The Journal correctly notes that Arizona and Nevada will benefit from this latest misadventure, as even more California residents leave the state: "Sharing a border with California is a gift that keeps on giving." Meanwhile, a separate AP dispatch punctured Kathleen Ronayne's grandiose perception of the once-Golden State, informing readers that there may be "reduced (energy) supplies for consumers during high-demand periods this summer." That's because California has failed to build the capacity needed to provide dependable, always-on energy sources.